Among the thousands of views that Werner Lenggenhager recorded in his sensitive walks about town is included this early 1950s photo of the old Olympic Block, a view of the southeast corner of First Avenue South and Yesler Way. The Olympic was constructed soon after the city’s Great Fire of 1889 employing the classical designs of the short-lived but busy post-fire architectural partnership of Charles W. Saunders and Edwin Houghton. While architectural taste is endlessly debatable, the rhythms in the Olympic’s ranks of arched windows are for me quite satisfying. 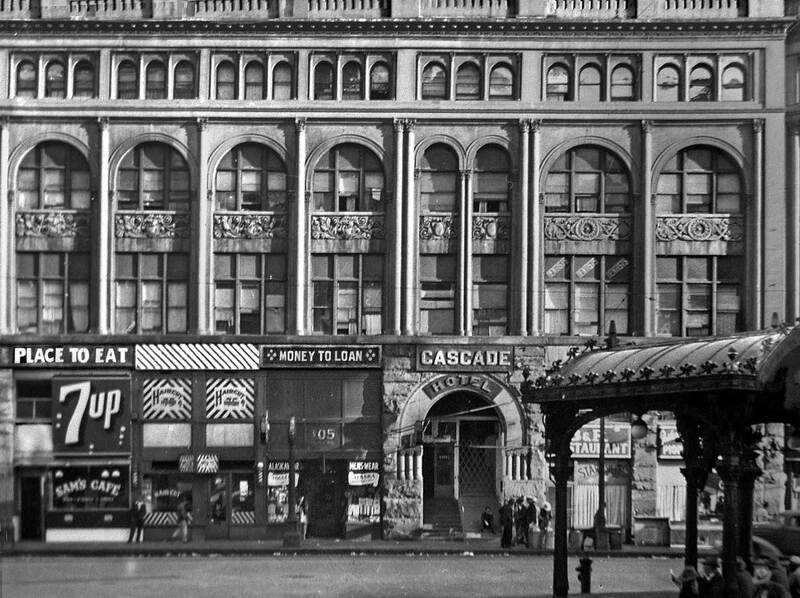 However, Lenggenhager’s portrait reveals how in the 1950s the Olympic’s classical restraint was slapped with gaudy signage appealing to basic needs like “Place to Eat” and “Money to Loan.” Sam’s Café and the B&R Café, at either end of the Yesler Way facade, were steady fixtures for many of the neighborhood’s down-and-out years. In between these eateries one could get a cheap haircut, buy a cheap suit and, in the Cascade Hotel, rent a cheap room. In the 1890s, when the building was new, much of it was used by the outfitters Cooper and Levy in their Alaska trade. Another steady Olympic tenant was the ticket and baggage agent for the Northern Pacific Railroad. Seattle’s preservationists lost the Olympic Block in 1972. 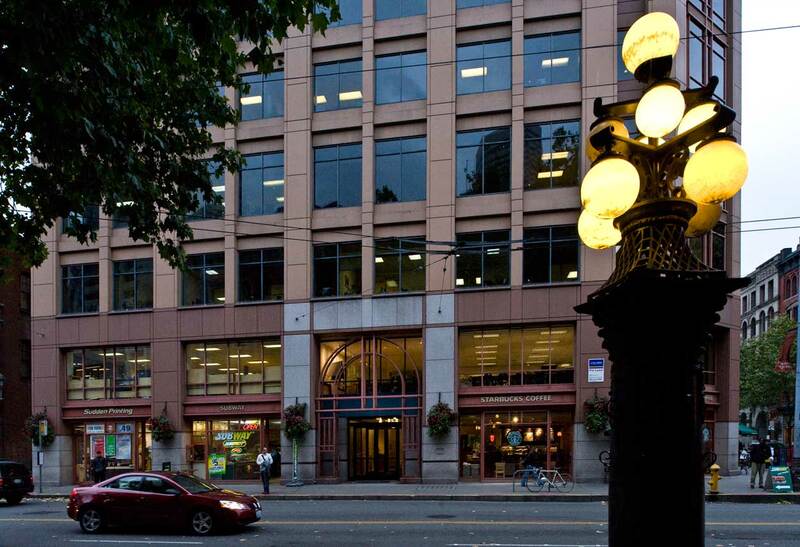 First, a corner of the Olympic collapsed when local leaders of Pioneer Square’s preservation were meeting across Yesler Way in the Brasserie Pittsbourg cafe. They felt the fall. A supporting wall had been mistakenly removed during a remodel. Two years later, what remained of the Olympic was demolished. 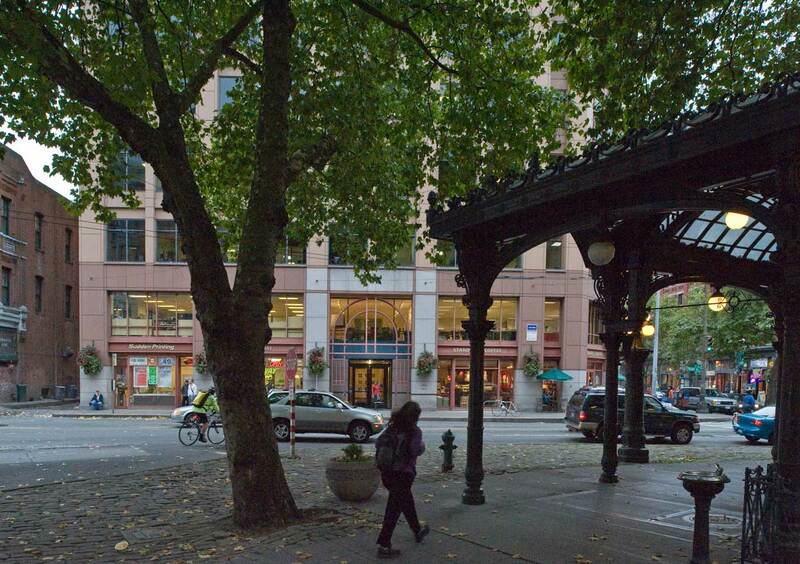 THEN: With the clue of the ornate Pergola on the right, we may readily figure that we are in Pioneer Square looking south across Yesler Way. NOW: A modern Olympic Block replaced the classical one in 1985 with massing — including an arched entrance — that repeated some of that designed for the 1890 original.